A 27-year-old man has appeared in court charged with the murder of Pc Sharon Beshenivsky in Bradford two years ago. 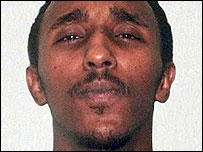 Mustaf Jama, who was extradited from Somalia, appeared at Leeds Magistrates' Court. He was remanded in custody until a crown court hearing on 9 November. He also faces charges of robbery, possession of firearms and possessing prohibited weapons. Pc Beshenivsky, 38, was shot dead and a colleague was wounded during a robbery at a travel agency in November 2005. Mustaf Jama was flanked by two police officers throughout the five-minute hearing. He was initially handcuffed but they were removed at the request of District Judge Roy Anderson. Five people, including Mustaf Jama's brother Yusuf Jama, have been jailed over the case. Pc Beshenivsky was killed on 18 November - her daughter's fourth birthday - as she arrived at the scene of a robbery at the Universal Express travel agency. 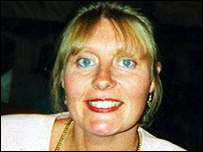 Pc Teresa Milburn, 37, was also shot but survived. Yusuf Jama and Muzzaker Shah were both jailed for a minimum of 35 years at Newcastle Crown Court last December. Faisal Razzaq and his brother Hassan Razzaq were jailed for 11 years and 20 years respectively for manslaughter, robbery and firearms offences. Earlier this year, Raza ul Haq Aslam was jailed for eight years for taking part in the robbery. Another gang member believed to have been involved in the shooting, Piran Ditta Khan, has still not been traced. Mustaf Jama was extradited from Somalia on Thursday and taken from Heathrow Airport to a police station in Leeds, where he was charged with murder on Thursday night.